Mini Enduro is the new fun exciting way to race Enduro on a mountain bike. Its aimed at new riders to the sport to give it a go and we also have the Pro am category for the more established racers. There are 3 stages with professional timing on every stage with transfers in between, these transfers are not timed and do not count for the overall standing. Gravity Enduro in the Uk has been created and driven by Steve Parr at the National level in the Uk with little or no other races to give riders a stepping stone into Gravity Enduro racing. The great success of the Mini Downhill races is to bring new riders into racing downhill and we want to recreate this with Mini Enduro, So if you have never raced an Enduro before or just want a bit of fun racing Enduro away from the pressure of Uk Gravity Enduro series, perfect come and try a Mini Enduro. Professional timing on all stages. Three stages all timed live so you have instant results exactly the same has in our mini downhill races. All three stage times will be added together and fastest cumulative total time will used for the results. We all have our speed of racing some are fitter & faster then others which can lead to fast riders catching up slower riders on the stage. If you over take a slower rider on the stage then you can continue in front of the slower rider for the start of the stage. This will stop the faster rider always catching the same rider again in the next stage. At the start of each stage there will be a time control. In the interest of safety each stage has a cut off time. You must reach the TC no later then your start time which you will be advised of with your stage start times. Timing has been a problem at Enduro races across the world, even now there are all sorts of different ways to time Enduro. The dibber is used for other races and its a cheap compromise but not really very good for race as its designed for orienteering where seconds don’t really count. 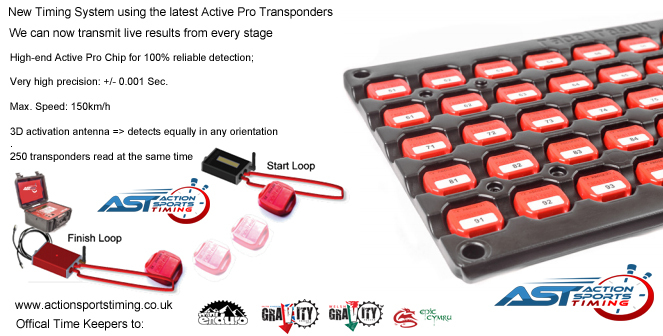 Timing chips were used for the Uk Gravity Enduro series in 2011/12 which have had issues. Since 2013 We are now the official timing keepers the Uk Gravity Enduro Series. New fro 2015 – Active Pro Transponders, using the latest cutting edge technology we have now invested in Active Transponders, unlike cheap passive chips the Active Transponders send out a signal to the timing decoders to give you super accurate times to 1/100 second up to a speed maximum speed of 150mkh and automatically upload the live time to the web so anyone any where in the world can watch all the stage times live as they happen. Pedal Assist Bicycles are get for the less active riders to race on, they get there own category to race against each other. For Example if your in the at least the top 10 of your category Junior, Senior, Master, Vets in the Uk Gravity Enduro Series you should race Pro-Am so you can test yourself against other quick riders and rider a different group of riders which will spice things up and hopefully make it more fun racing a Mini Enduro. There are 3 stages in each event, with transfers in between these transfers are not timed and do not count for the overall standing. Special stages close at a specified time, to ensure the event finishes on time. Riders will be notified at registration on the morning of the event. All Competitors must be self sufficient and prepared for a varying climate as well as any basic mechanical repairs. Consideration should be given to the nature of the course and the length of time the event may take to complete. Each rider receives a start time for each stage. In the interest of safety there is a cut off time, you will be advised of this in your stage start times. There will be minimum 30 second time intervals between riders starting a special stage or more depending on the nature of the track. If you stop to help an injured rider you may repeat the stage. You must first check out of the stage, then cycle back up the hill without assistance in this case. If, while passing a slower rider, you cause them to crash or run off the course, you may be disqualified. You may NOT repeat the stage if you suffer a mechanical failure on course. Riders who retire must return to the registration tent as soon as possible and follow the instructions of race marshals. The ranking of each competitor is the total sum of the special stage times, plus any time penalties. In the unlikely event of a tie after 3 stages, the competitor with the fastest final stage time will win, if there is still a tie then we will use the count back rule to decide the final finishing places. The Rules may be changed depending on light and weather conditions. How can I enter for the forest of dean Enduro race? ?